Every day, people are injured or killed in vehicle accidents on the freeways, highways and roads in San Leandro and throughout Northern California. These accidents can take a significant physical, emotional and financial toll on the victims and their loved ones. Our law firm represents clients in a wide variety of personal injury cases involving automobile accidents and collisions. Following an accident, it is important to immediately consult with an experienced lawyer to ensure that your rights are protected. Crucial evidence could be lost and witnesses' memories fade if we do not complete a prompt and thorough investigation. If you have been in an auto accident in San Leandro, CA or on I-580, I-880 or any other major thoroughfare in Northern California, Moseley Collins is here to help you get the compensation you need. Our firm was founded over 30 years ago by Moseley Collins and we have the knowledge and resources to go up against the insurance companies and get you a fair settlement. 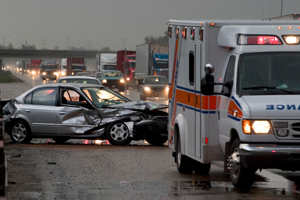 Have You or a Loved One Been Injured in an Auto Accident in San Leandro, CA? Call (800) 426-5546 to speak with a car accident attorney now. Authorities believe drugs were a factor in a fiery fatal crash that closed all lanes of eastbound Interstate 580 early Friday morning. The wreck happened about 4:20 a.m. when the driver of a Kia crashed into the center median at 164th Avenue, causing the car to overturn numerous times, said Officer Eric Thomas, a California Highway Patrol spokesman. The driver, a 32-year-old Fremont man, and his passenger, a 25-year-old San Francisco woman, were ejected. The woman died, and the man was taken to nearby Eden Medical Center in Castro Valley with major injuries, Thomas said. A passing motorist stopped to help with what he thought was a disabled vehicle. Soon, though, a Honda Pilot crashed into the Kia, causing it to burst into flames, Thomas said. The driver of the Honda, a 73-year-old Hayward man, suffered minor injuries.